After this beer came in at #3 in The Hottest 100 Beers this year I thought I better revisit it, as I remember is as a decidedly ordinary beer. So here we are, lets see if the wider Aussie beer community know what they're talking about. Since opening in 2008, 4 Pines has gone from strength to strength steadily out growing sites and seeing their beers spread nationwide. Their Keller Door range is widely reputed and sought after, their latest offering the Citrus IPA was really good! The Pale Ale is one of their core range beers and according to the bottle is hoped with Citra, Amarillo, Cascade and Simcoe - all hops I enjoy. 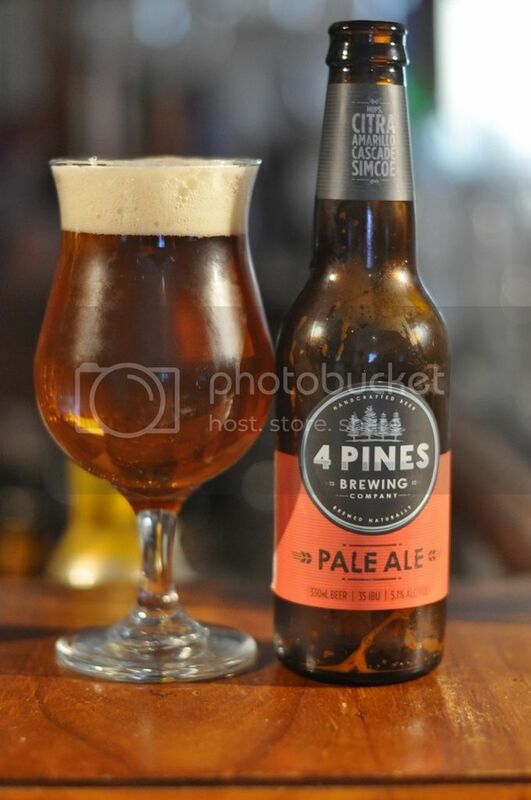 The 4 Pines Pale Ale pours quite a deep colour for the style. It's a very deep golden, almost amber colour with a reddish tinged cream head on top. The head is maybe two fingers high and has a number of medium sized bubbles in it, however it has good retention and there is still some left at the end of drinking. It's a good looking beer. Onto the nose and it's not particularly impressive. There is some grapefruit and pine aromas but they don't seem to be particularly bitter. This could be because the malt base is a bit overpowering on the nose. It's mostly a caramel malt base however I also get notes of breadiness and even some chocolate, which seems odd to me... Anyway, it's not offensive to smell but nor is it particularly alluring. Much like the aroma I thought the flavour was a little underwhelming. It was quite malty with quite a bit of earthiness combining with the caramel and bready malts. There was no sign of the odd chocolate aroma I was picking up on the nose. Unfortunately there wasn't that much in the way of hop flavour either, with only light citrus and tropical fruit elements coming through. It does drink very easily though and before you know it, it's gone. This revisit has just reinforced my initial thoughts about the beer, it's simply not as good as people make it out to be. It's a solid Pale Ale, but it is not fit to stand alongside the like of Stone & Wood Pacific Ale and Feral Hop Hog on the podium of the Hottest 100. Maybe it's the lack of hops that I'm not liking, I might give this to a few of my friends who are more used to macro stuff and see what their thoughts are. To the experienced craft beer drinker though, this isn't going to cut it. 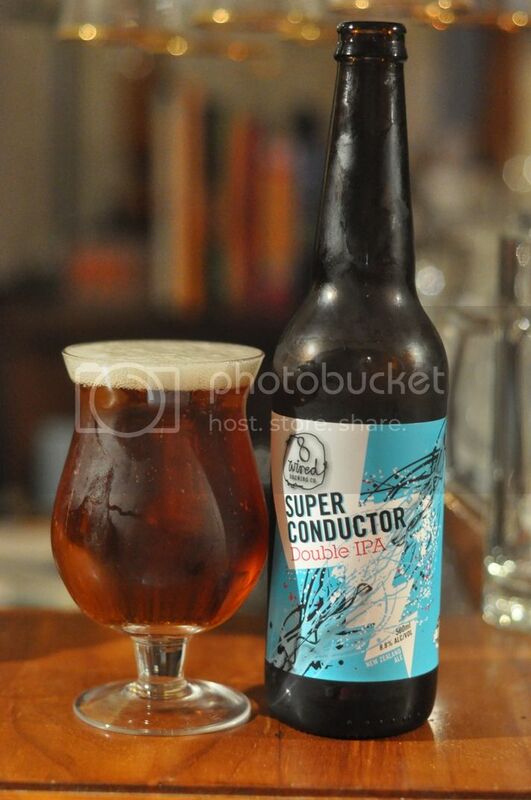 Hey mate, I'm a big fan of this beer. I'm a big fan of S&W Pacific too but I wouldn't categorise these two as being in the same ballpark stylistically. One, being the 4P definitely has a bitter (albeit not overpowering) hop as well as more of a traditional hop fragrance. The S&W is all late hops, very little bitterness. I enjoy them both. I'd say, without having tried more than 15 or so, that the 4P is my fave Oz Pale. Alongside Red Seal (non-Oz) as a couple of my faves. I should point out that I'm no IPA/Double IPA hop hound though. I agree, stylistically these two are very different. What I was referring too was the Hottest 100 beers (link: http://thelocal.com.au/darlinghurst/hottest-100/) and how I don't think it's as good as a number of the other top beers. As a popular vote though, it's clear that many people agree with you though. Red Seal is a top beer!